We had a great time visiting Sara and her family in the state of Washington. It is great to see everyone and the grand kids love to see their grandmother. Our schedule to visit Sara and family was around Andrew’s Baptism. After turning eight years old, he was ready to be baptized. Mike’s dad, and sister and family also flew to Washington for the event. On Saturday morning we drove over to the church to get some pictures. I don’t mean just a couple of pictures but many many pictures. Here is just one of them. The must have coordinated what they were wearing because all the women were wearing blue and white. It was a wonderful baptism. Anne and Mike’s Dad, Al, gave talks. Mike performed the baptism of Andrew. That afternoon we all headed to Bainbridge Island for dinner. There are two ways to get there and we choose to go the round about way over some bridges. We all had a great dinner. We decided to go back a different way, using a ferry that takes you to Seattle. I checked on my iPhone and found the ferry schedule and we saw we had about 20 minutes to the next one. We wanted a bit more time so we drove over to the ferry and after paying, parked on one of the lanes to the side. We waited for all the cars to board that ferry and then moved into the lanes so we would be the first ones for the next ferry, whcih was scheduled one hour later. We left the cards locked and headed on foot back to look around. We found a park where the kids could play. We could not wait too long because our cars were in the lane to board the next ferry. We were headed back and could see we need to move quickly. The drivers of the cars had to start to run and we got to our cars less than a minute before we had to start driving them onto the ferry. The others walked on board and we found each other on the passenger deck. It was a great view of Seattle as we approached. Then it was back by freeway to Sara’s house. It was a wonderful day. While visiting Sara and family we went on a couple of bike rides along some of the routes we had discovered in the past. On Thursday we headed out from Sara’s house on a route that took us to Far West, then on to Steilacoom. We made a stop at the Pioneer park where they were having a street fair. Anne went to buy some goodies at the street fair. Someone offered to take our picture together. We then rode to do a loop around Graverly Lake before heading back home. It seemed like a long ride with all the traffic, but we only ended up with 28 miles. We used the iPhone to plot out the course we had taken. The next day we decided to go on a longer ride so we put the tandem in the car and drove about 10 miles to past Lacey to ride on the bike trail out to Yelm. It is an interesting ride and a way to avoid all traffic, except at some of the roads where the trail crosses the streets. The trail went under an old rail road bridge so we had to get a photo of that. We stopped for lunch at Yelm, thinking to try a different place than we had ate at before. But I guess there are just not any good places so next time we should pack our own lunch and enjoy it at one of the picnic tables along the trail. We returned to the car and then headed the other way on the trail to see where it went, but after a couple of miles it came to a busy street so we went back to the car. The parking lot for the trail is right next to a lake. You can see the route we took on this map. I decided to take my new iPhone 3GS on the run today with Anne. It is not exactly small enough to run with but I wanted to test out the GPS function. My original iPhone did not have the GPS. I used the MapMyRide application that recoreded the run. I also used my Polar heart rate monitor with a footpod which I have previoiusly calibrated. We ended up with 7.40 miles per the Polar and 7.42 miles per the iPhone. Remarkably close. The iPhone application also saved my workout and route we took, as you can see below. This past weekend John was able to stay over an extra day after a business trip and joined Anne and Franz on a 33 mile bike ride around the reservoir. The weather was perfect for cycling. We had a great time. We love it when the kids get a chance to visit. On Saturday, John and Franz joined a club ride that was going up Mt. Diablo and then climb Morgan Territory. Franz was hoping to break the 1 hour barrier on the climb but was not quite able to do that. Near the bottom a fast rider went by us and John jumped on his wheel but Franz kept the pace. Franz lent John his second Polar heart rate monitor so we could capture the data for both riders. It is amazing how close the heart rate curves were during the climb. Since this was John’s first time up Mt. 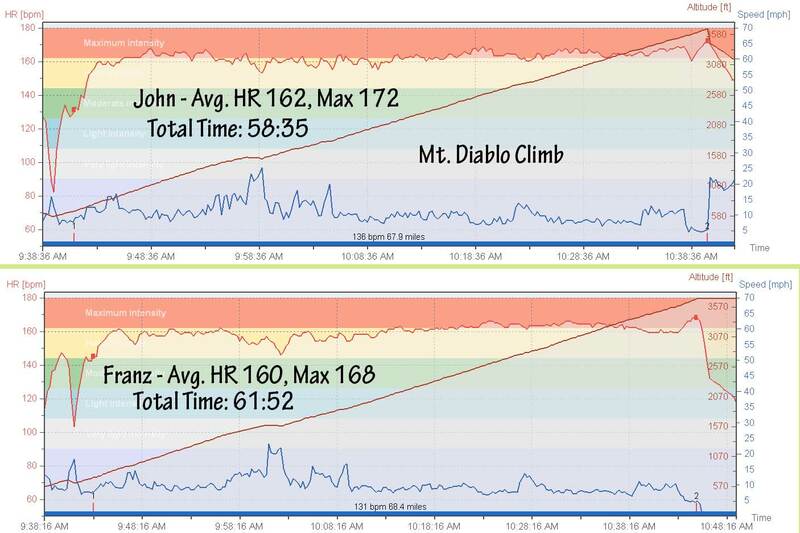 Diablo, he stopped before the final steep section, thinking he was already at the top, so his real time would have been closer to 58 minutes. We got so far ahead of the other club members that we decided to descend part way down and then climb the top portion again. We then biked with a couple of other club members over to have lunch. It was then a fast descent to the valley floor and then a stiff headwind for 15 miles back to the car. We ended up with nearly 70 miles and over 9,000 feet of climbing. Good training for our Tour of Utah race next month.